Beyond our core Compass software, we build and maintain custom projects, public web pages, and legacy software. Here we highlight some of our work. 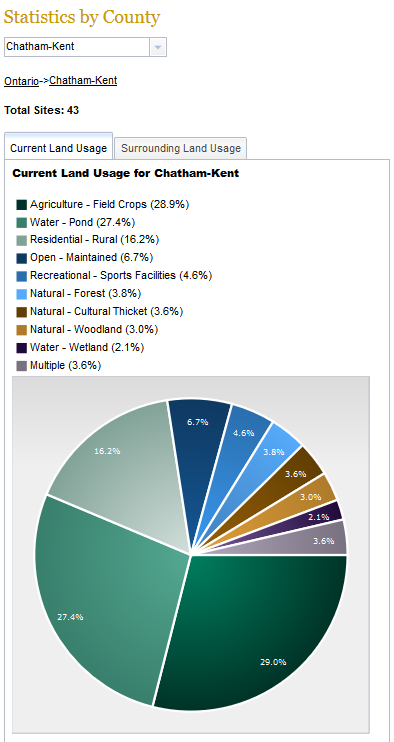 Greycoat Software has worked with clients of all sizes, from single person operations, to transnational corporations. See our Clients List here. 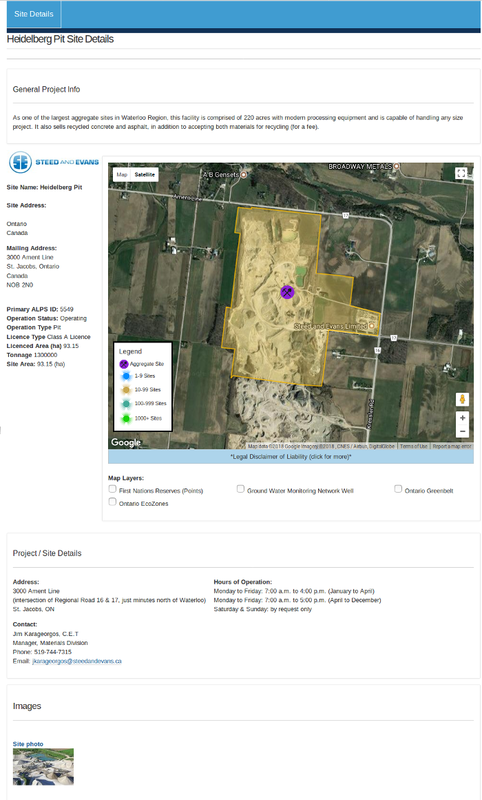 OpenAggregates.ca is Greycoat Software’s online portal for sharing information about aggregate pit and quarry operations in Ontario. 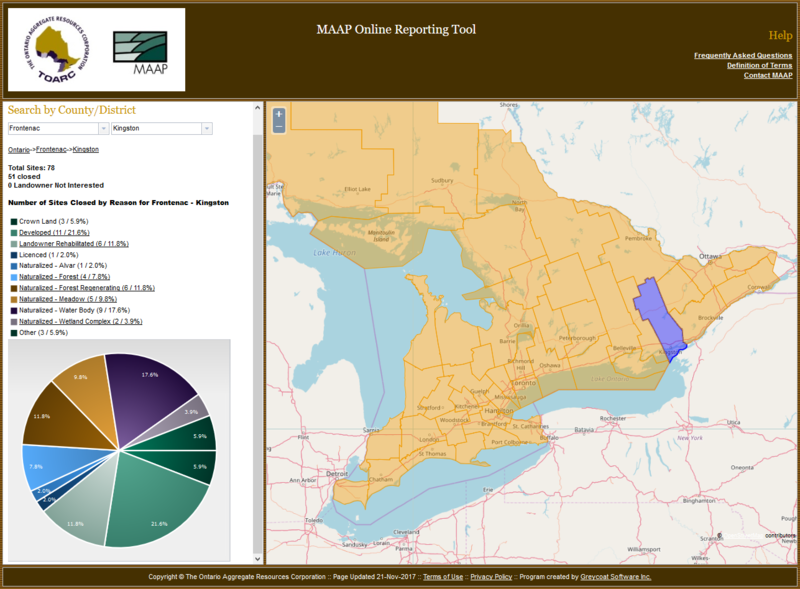 Using open data from the Ministry of Natural Resources for the base data, then working with aggregate companies to update their listings, Open Aggregates indexes pit and quarry operations in Ontario, and presents each company and site on their own unique page, and on an interactive map. Designed with government regulations and and industry best practices in mind, Open Aggregates is the ideal place to present and share information about existing aggregates sites, proposed site expansions, and new aggregate operations. Click here to visit Openaggregates.ca and contact Greycoat Software to personalize your company's listing and enhance your aggregate operations' profile. 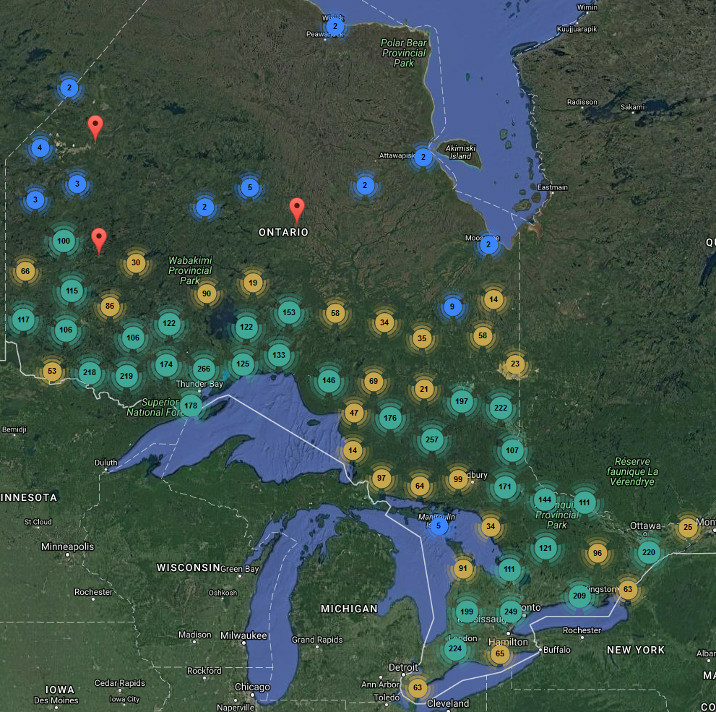 Screenshot 1: Cropped view of the mapped area for Open Aggregates. Screenshot 2: Detailed Site view of the Steed and Evan's Heidleberg Pit. 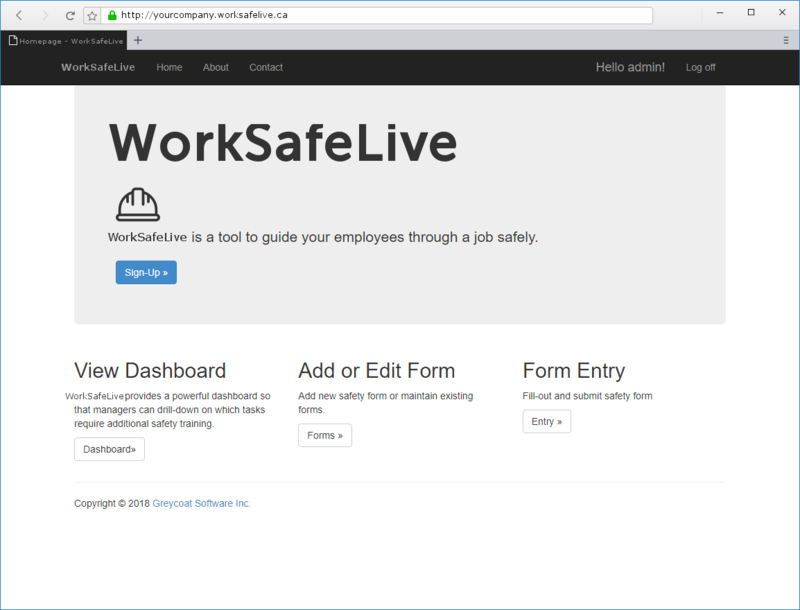 WorkSafeLive is an on-location task specific safety review and reporting application for smartphones and tablets which was first developed with an industry partner and has now been released for cross-industry use. From the available list, select the appropriate form for the unlock task. Answer questions as they are presented & submit the form. 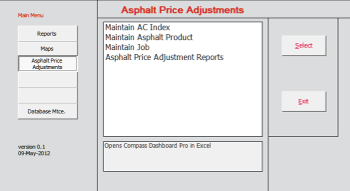 The Asphalt Cement Price Index Report (ACPIR) is software built to adjust reported costs according to MTO and municipal asphalt-cement price index calculations. 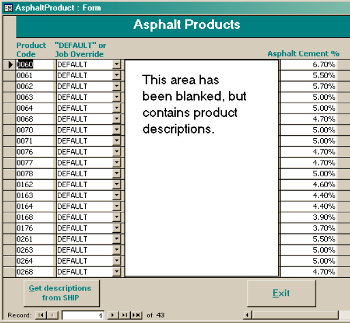 ACPIR is an Microsoft Access developed program designed to calculate actual costs of products on their delivery day at multiple job sites, adjusted by the percentage of asphalt-cement in the load and the original tender price. 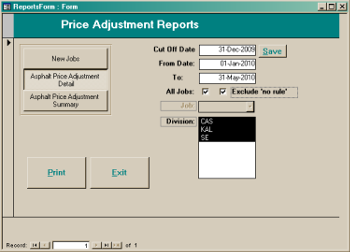 The ACPIR report generator tool. 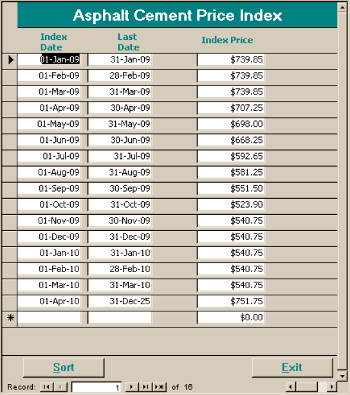 ACPIR Price Index Control Page. The MAAP Online Reporting Tool was created by Greycoat Software at the request of The Ontario Aggregate Resources Corporation (TOARC) to provide the public with self-service access to information on legacy pits and quarries while respecting the right to privacy of the individual landowners. The MAAP program is utilizing MORT as a means of sharing the status of the legacy sites across the province, showcase the naturalization of many legacy sites and highlight excellent rehabilitation that has been completed while maintaining landowner confidentiality. 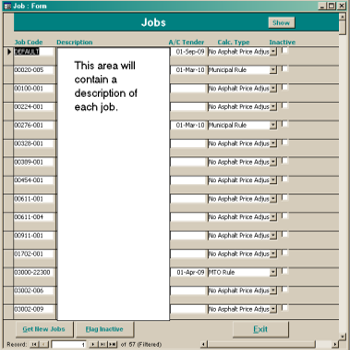 Screenshot 1: Full view of program in use on the web. 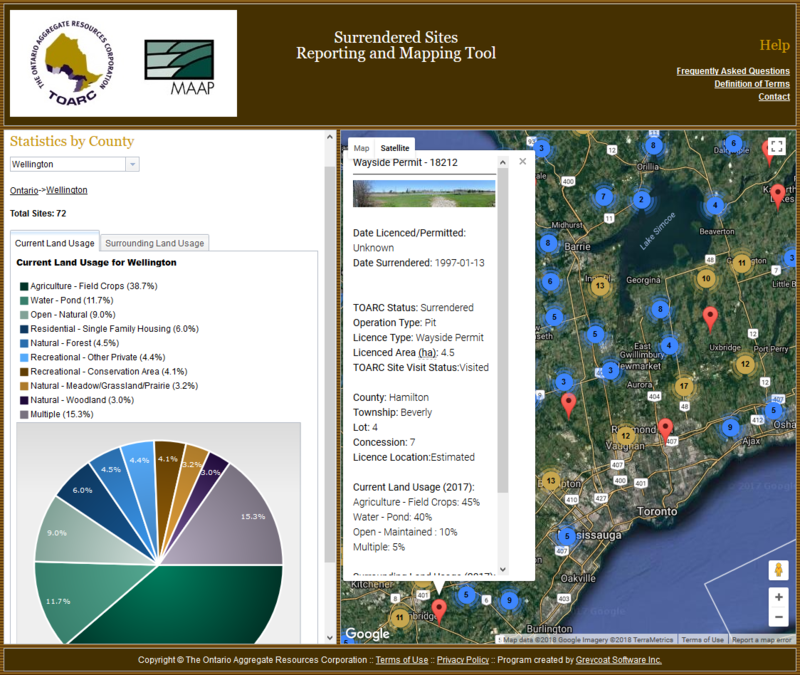 Greycoat Software created The Surrender Sites Online Reporting Tool at the request of The Ontario Aggregate Resources Corporation (TOARC) to provide the public with information on the end-use of aggregate pits and quarries in the province while respecting the right to privacy of the individual landowners.